Just a small sampling of what you will find when you visit us. Sheri has been collecting jewelry since she was a very young girl. With memories of her Mother getting dressed mixing her costume with her fine, she developed a keen sense of style. 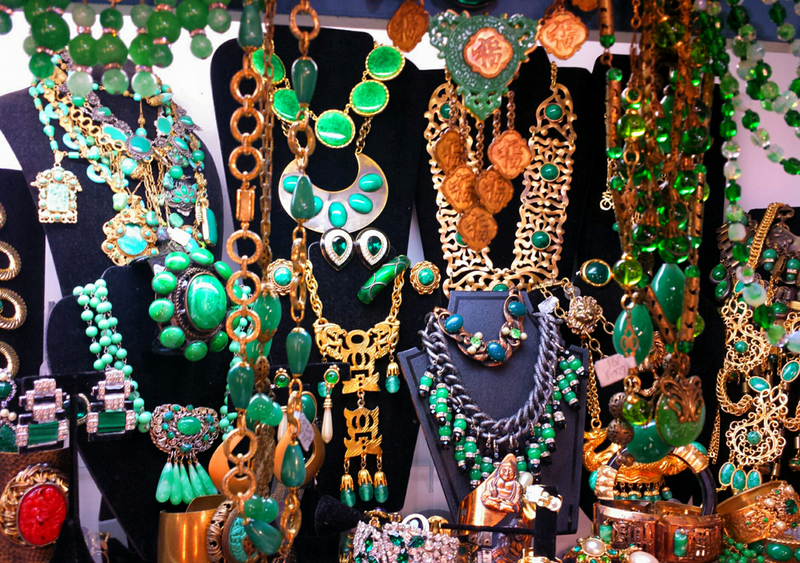 Hattie Carnegie genies, mixed with Emeralds. The ways to wear the jewelry was as important as the pieces themselves. If you feel good in what you are wearing, people will notice. There is a definite love between the objects and the design in this realm, almost like a pirate's booty from some magical land, the sheer breadth of items will have you mesmerized. Time doesn't matter as you play in this vast collection that spans the decades from the late 1800s, through all the decades past and a nice mix of some contemporary designers. Always on the lookout for style trends, you will get plenty of help in completing your look from this ex clothing designer turned Jewelry Goddess once you enter her realm of magic.